Crude tumbles into bear market… Gillette’s strategic retreat in the razor blade wars… what not to say to a poll worker… and more! About three weeks ago, the president promised a 10% tax cut targeting the middle class effective next year — perhaps because much of the benefit from the tax cut this year was offset by rising gasoline prices. At the time, House Ways and Means Committee Chairman Kevin Brady (R-Texas) appeared to rule out any tax cut action during the “lame duck” session of Congress in November and December. Wait till next year, in other words. And with Democrats taking over the House come January… the whole thing’s now a moot point. Enjoy the middle-class tax cut you’ve got now… because that’s all you’re getting. What’s more, if you’re middle class, you’re carrying a disproportionate share of the tax burden. At an early age, Robert says he learned from his “rich dad” mentor that — aside from the Civil War — income taxes were unheard of in the United States until the 16th Amendment was ratified in 1913. Under the Revenue Act of 1913, a 1% tax was levied on net personal incomes above $3,000 — or about $76,000 in today’s dollars. That was it — apart from a graduated surtax on incomes starting about $507,000 in today’s dollars. “Although the income tax was intended to punish the rich, it wound up punishing the poor and middle class,” Robert goes on. “The problem was that the government’s appetite for money was so great that taxes soon needed to be levied on the middle class, and from there it kept trickling down. “But the rich saw an opportunity because they don’t play by the same set of rules. The rich knew about corporations. “It is the knowledge of the legal corporate structure that really gives the rich a vast advantage. For proof of Robert’s assertion, we return to one of the most important book passages we’ve shared over the years in The 5. It’s from the 2009 book Endless Money, by the Baltimore-based money manager Bill Baker. “Tycoons such as Soros and Buffett can call for higher taxation of income,” Baker wrote — and that emphasis on the word “income” makes all the difference. How did we reach this sorry state of affairs? For Robert, once again it comes back to education. The pointy-headed intellectuals who write tax legislation — people like his “poor dad,” who was a government official — will always be outfoxed by rich people who understand the power of money — knowledge not taught in schools. “The problem,” says Robert, “is that the people who lose are the uneducated: the ones who get up every day and diligently go to work and pay taxes. If they only understood the way the rich play the game, they could play it too. Then they would be on their way to their own financial security. “This is why I cringe every time I hear a parent advise their children to go to school so they can find a safe, secure job,” Robert laments. “An employee with a safe, secure job without financial aptitude has no escape. “Average Americans today work four–five months for the government just to cover their taxes. In my opinion, that is simply too long. The harder you work, the more you pay the government. Sure, you could get mad. But it’s better to get rich — or at least richer than you are now. That’s the whole reason Robert is organizing the Weekly Cash Flow Summit next Wednesday at 1:00 p.m. EST. It will be his debut event as a member of the Agora Financial family. Attendance is free, but space is limited. Reserve your spot now at this link and you’re in. The major U.S. stock indexes are in the red this morning, but still on track for a big weekly gain by day’s end. At last check, the Dow is holding up best, with a loss of less than 1% at 25,962. The Nasdaq is getting hit hardest, down 1.75% at 7,398. ⇒ A noteworthy exception to the selling — the consumer products giant Procter & Gamble, up a bit after announcing it would cut some management fat, a move our Zach Scheidt anticipated in this space a year ago. But beyond the next few weeks, Mike says it’s looking great — simply based on where we are in the four-year presidential election cycle. 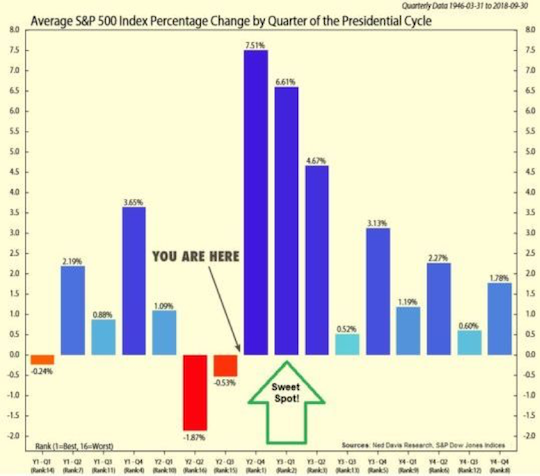 Courtesy of the respected Ned Davis Research, here’s a chart of the market’s quarterly average performance across every four-year cycle going back to the end of World War II. Meanwhile, the commodity complex is getting clobbered. West Texas Intermediate crude just cracked below the $60 level — a 22% drop in barely a month. And gold is down more than 15 bucks to $1,207. That’s a $25 drop for the week. Ironically, gold’s tumble this morning began at the very moment we got indications inflation is running hotter than previously thought. The Bureau of Labor Statistics said wholesale prices jumped 0.6% in October — the biggest monthly jump in six years. Among dozens of economists polled by Econoday, the average guess was a 0.2% increase. Usually, hotter inflation pushes the dollar price of gold higher. But a number like today’s only increases expectations that the Federal Reserve will continue to “tighten” monetary policy, and that’s a drag on gold. Certainly the Fed signaled more tightening yesterday in its every-six-weeks policy statement. This morning, traders in fed funds futures are pricing in a 76% probability of another increase in the fed funds rate six weeks hence. All that said, the question is whether producers can pass along rising wholesale prices to you and me. We’ll get a handle on that with the consumer price index next week. Back to Procter & Gamble: It’s not just the management structure that’s getting streamlined. So is one of the company’s signature products. Starting with the three-blade Mach3 in 1998, Gillette has kept upping the blade ante — culminating in the Fusion of 2009, featuring five blades plus a sixth on the back for sideburns and mustaches. For a while, competitors were running parody commercials on TV. 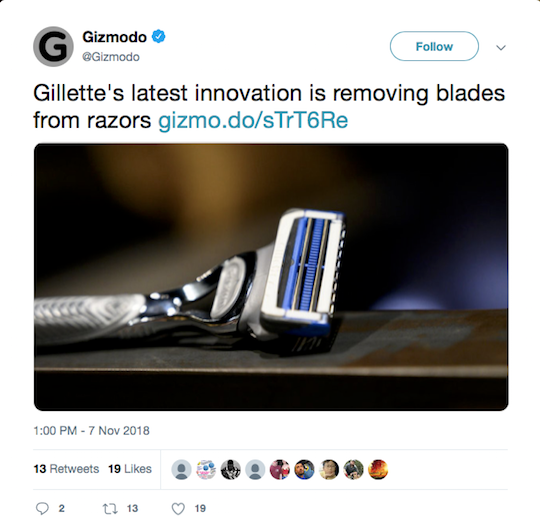 This week during Gillette’s Global Innovation Summit in New York — yes, there is such a thing and that’s what they call it — the company rolled out the two-blade SkinGuard Sensitive. Apparently “low cutting force” comes at a high premium! The 5: Growing up in the Chicago area, your editor was well acquainted with the expression “Vote early and often” from a young age. There’s an entire Wikipedia page devoted to the phrase and its variants, although its research might be suspect. Regardless, the phrase has been attributed at times to three Chicagoans — gangster Al Capone and mayors “Big Bill” Thompson (1915–1923 and 1927–1931) and Richard J. Daley (1955-1976). P.S. We’re now only five days away from the Weekly Cash Flow Summit, featuring Agora Financial’s newest superstar contributor — Rich Dad, Poor Dad author Robert Kiyosaki. Next Wednesday, Nov. 14, at 1:00 p.m. EST, Robert will reveal a revolutionary technique for pulling in weekly streams of cash — up to five figures, depending on how you execute the strategy. Sign up at this link with your email address and we’ll shoot you a reminder complete with a link to the event as we get closer to the day.